The premise for this recipe is simple. Bacon ends were rendered in a skillet, to which chopped shallots were added, then briefly sautéed. Toss in a bunch of chickweed and some radish greens, combine with cooked pasta, then finish with chopped herbs and breadcrumbs. All told, dinner in twenty minutes. You can use any combination of greens, from arugula and watercress, to turnip greens and lamb’s quarters. I really love the sweetness of chickweed, paired with peppery radish greens. They’re great. If you want to make this vegetarian, omit the bacon and use olive oil or butter. I was going to do a riff on spaghetti carbonara (using nearly soft-cooked eggs in place of raw beaten egg), but I miscalculated cooking the eggs so I went in whole new direction instead. I should add that nearly all of the ingredients were obtained from local farmer’s markets. Bacon from Flying Pigs Farm in Shushan, New York; chickweed from Paffenroth Gardens in Warwick, New York and radish greens from Stokes Farm in Old Tappan, New Jersey. All three vendors make their appearances regularly at Union Square Greenmarket, in New York City. Have your pasta cooked before you prepare the sauce. Render bacon in a large skillet, about 5 minutes. When bacon becomes crispy, add shallots to the skillet. Sauté until shallots become lightly golden, then add greens to the pan. Partially wilt greens, approx. 30 seconds and remove from heat. Stir in cooked spaghetti. Toss. Taste for salt and pepper; you shouldn’t need all that much. Stir in breadcrumbs and herbs (I used onion chives and sage), then serve at once. 27 May	This entry was published on May 27, 2010 at 2:13 pm. It’s filed under food, general, spring, Union Square Greenmarket and tagged bacon, chickweed, Flying Pigs Farm, greens, Paffenroth Gardens, pasta, quick and easy, radish greens, seasonal and local, Stokes Farm. Bookmark the permalink. Follow any comments here with the RSS feed for this post. You know, I have next to no experience with greens — cooking them, eating them, or otherwise. This looks so good! 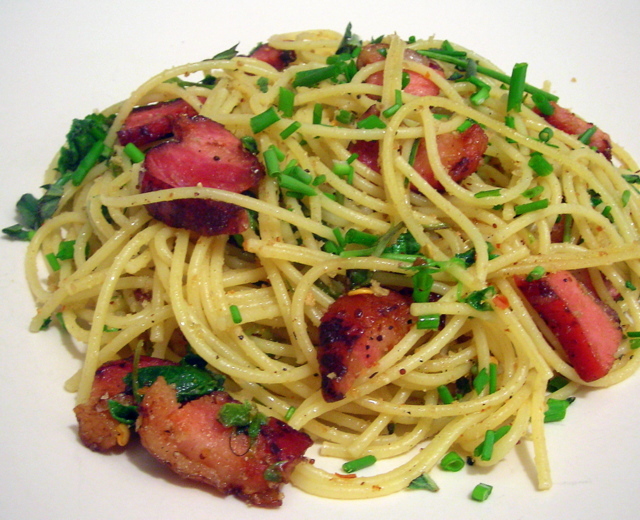 I love pasta dishes; so almost anything on pasta sounds good !